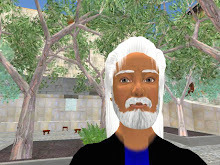 Now that I’ve decided to come back into Second Life a bit, I should catch up on events in the Confederation of Democratic Simulators (CDS), which has been my SL home ever since my avatar moved there in late 2007. To know more about what has happened in CDS during the past few years, I plan to take up again my project of writing the CDS Chronicles. There are several difficulties. What method can I use to accomplish this task quickly? And what moment in the past should I go back to in order to pick up the thread? In this post I will briefly present my solution to these two problems, and then discuss the wider implications of this writing project. Knowing by experience how long it takes to read the old RA transcripts and to digest the information on the forums, I am going to try a differen method. Rather than study forum posts in depth, I will just glance at the beginning of what seem to be the most important threads, to get a rough idea of what they are about. It should thus be possible to piece together a sketchy outline of the principle events and issues during past RA semesters. I plan to write one article (or at most two) for each RA semester, giving an outline of the main events. I will post the rough draft, leaving possibility to fill in gaps later as comments and in-world discussions improve my understanding of what occurred. I hope that some of those who were active will provide feedback with which I can fill out the posts in the future. Another lesson from my past experience is that I should report on current events in CDS in parallel with catching up on the past history. I therefore hope to provide posts about “CDS News,” as well as posts about “CDS History,” in order to avoid falling further and further behind as I did on prior attempts. Where to pick up the thread? My last post before becoming inactive was in May 2011. But my last account of a Representative Assembly (RA) meeting covered the RA of 23 August 2009, since I had fallen more than a year behind in my reporting. That meeting was the first RA meeting after the merger of CDS with-Al Andalus, which fell apart in July 2010, only a year later. The failure of the merger was one of the reasons I lost interest in CDS. At the time I was disappointed with the CDS leadership for their role in breaking up the merger. But with hindsight I see that they may have had a point: the conflict between two different conceptions of how to run a community may have been impossible to resolve in any other way. So where do pick up the thread? From August 2009, the time of the last RA meeting that I reported on? Or from July 2010, when the merger failed? Or from May 2011, when I wrote my last post before becoming inactive? I was participating in CDS in July 2010 when the merger fell apart. I thus know pretty well what happened up to that point, and can easily pick up the thread from there. But since the rhythm of CDS life follows the RA semesters, I should back up a bit further, to start with the elections for the 13th RA in May 2010. I can then cover the entire 13th RA, from the swearing in of the new representatives on June 1st 2010, to the elections for the 14th RA, in November 2010. The main reason I want to write these summaries is to learn myself what has been happening in CDS. But there are also wider implications of this project of writing up CDS history and news. A fundamental part of any democracy is the free circulation of information. Citizens must have the freedom to produce, distribute and consume information as they want. However, freedom of information is an empty formula if the information fails to circulate in a such way that citizens can have effective access to it. The information concerning the life of CDS is available to anyone on the publicly-accessible forums. But this information is in fact difficult to access, because it takes too much time to dig it out of all of the scattered and lengthy posts and comments. Making the news about CDS more readily accessible could thus be a significant contribution to the democratic process.